I posted yesterday about seeing Steelcase office furniture everywhere after I received the two MCM chairs. Last week I came across the name while viewing one of the more interesting sections of the Frank Lloyd Wright: From Within Outward exhibition at The Guggenheim Museum: the SC Johnson Building in Racine, Wisconsin. 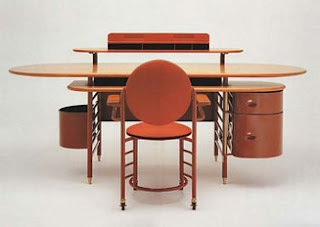 In 1936 Wright worked with Steelcase to produce modular steel and formica desks and chairs in his signature Cherokee Red for the SC Johnson Wax Administration Building that Life Magazine called the "most inspirational office building of the twentieth century". If you fall in love with the sensuous curves of the furniture you can purchase your very own Frank Lloyd Wright Johnson Wax 1 Writing Desk and Johnson Wax 2 Chair, although today they are no longer produced by Steelcase but by Italian furniture maker Cassina. and, in the 1980s, purchasing and fully restoring the Meyer May House in Grand Rapids, Michigan, which celebrates its 100th anniversary this year. Take the online tour here. 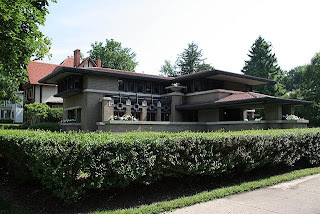 Steelcase is also sponsoring a Symposium on September 10 2009 to explore the relevance of Frank Lloyd Wright to 21st century architecture and design. The SC Johnson building has always been one of my favorites of Wright's work. Great post! 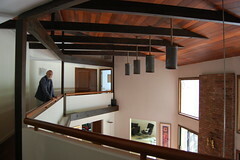 I loved learning a few new things about FLW. It's funny, I've seen documentaries about the office building but didn't remember the furniture, really. So cool. 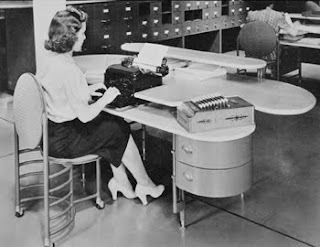 Can you imagine how loud it was in that big room with all of those typewriters going, back in the day? Julia, the construction of the building and materials used muffled the sound and diffused the light making for a tranquil working environment. It's the same in our house, the noise stays in each area - even though it's open plan and there's a double-storey room there are no echoes- that's the test of a great architect: designing for people. But I don't think I would have got any work done at the SC Johnson building - I'd be too in awe of the architecture and the furniture. Steelcase Soar Chair - The Soar Chair by Steelcase is equally heralded for the reason that Aeron Chair and with acceptable reason. The Leap has picked up numerous design awards and is particularly rated by the Wall Steet Journal for the reason that Best Desk Chair. The Leap is especially an excellent option for women because it's not necessarily large and cumbersome such as Aeron. The Leap is usually elegant, sleek and can be purchased in one size fits many. All parts are adjustable (the height on the chair, the arms, etc) along with the Leap is especially great because doing so has Steelcase's patented LiveBack technological know-how, which adapts to is very important of your back regardless how you are relaxing.